You know Dasher and Dancer and Prantzer and Vixen...and you know Miracle On 34th Street, It's a Wonderful Life and A Christmas Story--Christmas and holiday-themed movies that deserve an honored place n any video collection. So we're passing those by in our overview of Christmas DVDs in favor of some we feel need more attention. Our narrowcasting approach focuses only on four animated classics, all worthy of inclusion in any collection, all good viewing all year 'round. 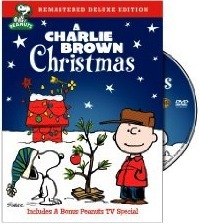 The most beloved of all Christmas specials has been reissued in striking remastered color and audio, allowing a couple of generations of viewers heretofore accustomed to the less vivid version previously available from Paramount to see the Yuletide travails and ultimate vindication of Charlie Brown as Baby Boomers remember it from the first TV broadcast in 1965. In addition, a minor cut has been restored, so that the audio in the dance scene is in sync with all the Peanuts gang rocking out to Schroeder's swinging keyboard stylings. So marvel anew at the hapless Charlie Brown's inability to command authority as the director of the gang's Christmas play or, seemingly, even to buy a respectable Christmas tree. But as he decries the increasing commercialization of Christmas, as his own dog, Snoopy, wins first prize in a holiday decorating contest for sprucing up his doghouse with flashing lights and fancy ornaments, as his nemesis Lucy cautions him that Christmas "is run by a big eastern syndicate," he pursues his lonely quest to find the real meaning of Christmas. In one of the most famous minutes in animation history, the insecure but famously insightful Linus, steps on stage, has the house lights dimmed, and recites the Gospel of Matthew’s story of Christ's birth. His voice is soft, sweet, at times halting, but always conveying a certainty in the truth of his message. "That's what Christmas is all about, Charlie Brown," he says in a memorable closing line to his beleaguered friend. 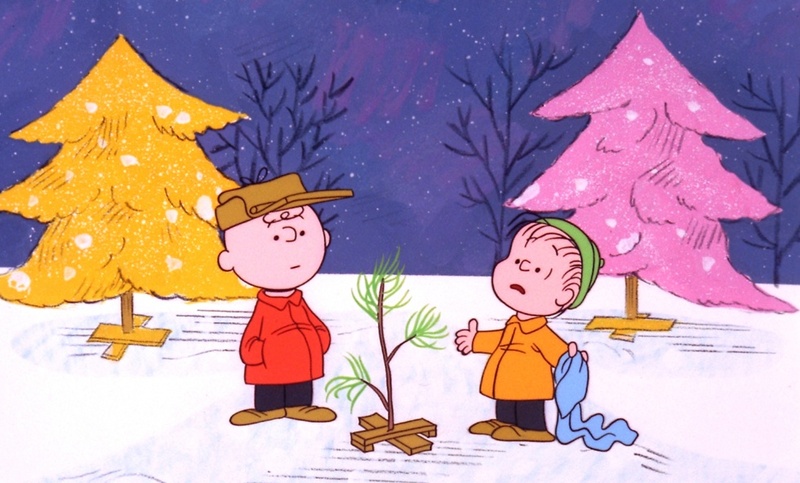 Thus enlightened, Charlie Brown, vowing not to let "all this commercialism ruin my Christmas," returns to salvage his undernourished tree, only to be devastated anew when one of its scrawny limbs collapses under the weight of a single red bulb. Once again to the rescue comes Linus, who sees something in the enervated evergreen. "Maybe it just needs a little love," he opines. Gathering the rest of the gang, he initiates a mass decorating project and the tree pops alive, to the shock of Charlie Brown, who happens upon the scene and is greeted with a rousing "Merry Christmas, Charlie Brown!" Whereupon all the children break into a quiet rendering of "Hark, The Herald Angels Sing." How perfect and how American, in all its silliness, neuroses, anxieties and big-hearted spirit. The simple animation serves the story well, but the child actors voicing the characters make the production special. Peter Robbins as voice of Charlie Brown, Christopher Shea as voice of Linus, Tracy Stratford as the voice of Lucy, Cathy Steinberg as the voice of Charlie Brown's sister Lucy, who's in love with Linus ("isn't he the sweetest thing? "), Chris Doran as Schroeder and Jeff Ornstein as Pig Pen--the key performances--are hard to imagine s being more perfectly realized. Of course, the other essential ingredient is Vince Guaraldi's impressionistic, light jazz soundtrack, his first of 15 such soundtracks for Charlie Brown specials and thus the initial installment of what became the most famous aspect of his exemplary body of work. Several of the songs here, including the beloved "Linus and Lucy" theme, were composed for the soundtrack of another Peanuts project, a 1963 documentary about Charles M. Schulz, A Boy Named Charlie Brown, and appropriated stylistic elements from jazz tunes Guaraldi had composed for how own Trio's highly regarded jazz albums (such as the falling snowflakes effect in "Skating," which Guaraldi had used in his tune "Ginza," on From All Sides, one of two albums he cut with Brazilian guitar legend Bola Sete). Marvelously conceived and beautifully executed, Guaraldi's score has become a permanent part of the Yuletide music canon. A Charlie Brown Christmas does not exist apart from Guaraldi’s music, since its moods are so inextricably linked to the narrative flow and to the characters' motives, enhancing and amplifying the onscreen action in a purely organic way, never as filler. Charlie Brown's frustrations with the Christmas season are of a different magnitude than Ebenezer Scrooge's in Dickens's A Christmas Carol, but in both stories the protagonists in question share a transformational moment that forever alters their basic assumptions about the world they live in, their response to it and the course their lives will take going forward. They learned how to keep Christmas well, if any alive could be said to possess the knowledge. Man or boy, it's never a lesson too late for the learning. Poor Frosty Returns. It has the advantage of having an animated Jonathan Winters (literally and figuratively) and a genial John Goodman as Frosty (and SNL's Jan Hooks, Andrea Martin and Brian Doyle-Murray in supporting voicing roles), original music by DEVO's Mark Mothersbaugh, is produced and directed in part by Bill Melendez of A Charlie Brown Christmas fame, yet hardly anyone seems to know about it. Its obscurity is perhaps directly related to its derivative nature: the animation looks like it was lifted right out of the "Charlie Brown" shows, at least one of the kid characters is almost a dead ringer for Pigpen, and the Melendez touch is evident in the characters' voices and movements and in the "Peanuts"-like feel of the scenes. It even has two lead kid characters who seem clones of Lucy and Charlie Brown--the male is even named Charles, and exhibits Charlie Brown-like fretting over his unpopularity among his peers as well as a Linus-like bent towards philosophical fatalism. The adults are grumpy, the script tries a little too hard to be hip (as when little Holly DeCarlo's mother asks her, "How are you going to feel when Charles grows up and has to join a support group?") and John Goodman's Frosty is a tad too worldly wise for a mere snowman. If it's not particularly inspired, Frosty Returns, originally aired in 1992, is fun, but no match for its predecessor, 1969's Frosty the Snowman, one of television's animated classics starring Jimmy Durante as the Narrator with the voices of Jackie Vernon as Frosty and Billy DeWolfe as Professor Hinkle, the Magician. The animation is striking, as the Rankin-Bass team's first foray into Disney-style cel animation produced a vibrant, three-dimensional feel and natural movements. The story is loosely based on the song, in which a snowman comes to life, but is developed to put Frosty into conflict with the over-ambitious Professor Hinkle, a lousy magician who believes his magic hat, so dysfunctional in his own hands but which brought Frosty to life when the kids placed it on his head, will ultimately make him a millionaire. The chase takes the participants to North Pole, pursued all the way by Hinkle, where he runs afoul of Santa but is offered a reprieve from being removed from the Christmas list if he’ll apologize in writing to the kids and to Frosy--redemption! The kids return home safely, and Frosty rides away with Santa on a sleigh, vowing, "I'll be back on Christmas Day!" The story is simply and beautifully told, good is rewarded, evil is punished, a second chance is offered, and all live happily ever after. Jackie Vernon plays Frosty with an engaging humbleness and generosity of spirit, DeWolfe revels in his bumbling wickedness, and the incomparable Durante-who is actually in the show as an animated character introducing the story at the beginning, and returning at the end to lead a children's parade through town, singing the title song all the way--is reason enough for this video to be in any serious Christmas collection. His rendition of "Frosty the Snowman" is a delight, pure Durante heart and soul in its funky delivery and easygoing good spirits. 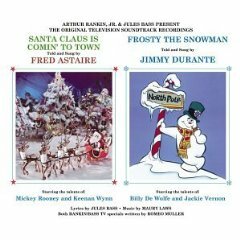 In addition to the video, the Frosty story in full, with Durante's singing and narration, is also available on CD, along with the soundtrack and dialogue from another animated special, 1970's Santa Claus Is Comin' To Town. Another Rankin-Bass-Muller collaboration, this story is told and sung by Fred Astaire, with other character voicings by Mickey Rooney, Keenan Wynn and Paul Frees (who gave Santa his voice in Frosty the Snowman), among others. For kids and adults alike, these three Disney holiday shorts are must haves. The vintage title here is 1952's "Pluto's Christmas Tree," featuring Mickey Mouse, Pluto, Chip & Dale, chronicling the misadventures of Pluto trying to run down the two chipmunks who have invaded his prized holiday evergreen, much to Mickey's consternation. Classic holiday mayhem, in a gentle sort of way, with no small number of humiliations visited on the beleaguered pooch. For the first time on DVD is the 1978 production, "The Small One," being the story of a boy in Biblical times who brings his donkey to market and gives it to Joseph, to take on his journey with Mary. Unfortunately, the Disney team has altered the original version of this classic, changing the words of one song and removing an entire song ("Small One for Sale") and segment. For now, this is the only in-print version of "The Small One," but caveat emptor because the packaging gives no hint of these changes. 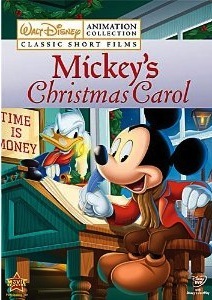 ‘The Small one’ (1978) is featured for the first time on DVD in the Disney Animation Collection 7: Mickey’s Christmas Carol. "Mickey's Christmas Carol" is 24 minutes of wonderful storytelling and inspired animation. It was, in fact, Disney's first new Mickey Mouse cartoon in 30 years. Those who can locate the original VHS release of this short will find with it a special featurette on the making of "Mickey's Christmas Carol," which offers an interesting look at the Disney animation factory in the '80s, including interviews with several of the animators and voiceover actors. Too bad that has disappeared from the DVD release. Also note the striking sepia-toned opening and closing titles. This is reputed to be the last animated production to feature full opening credits and a "The End" card at the close. 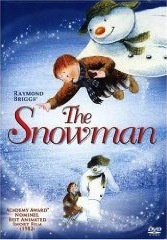 If ever an animated short possessed the quality of a dream, it is The Snowman, as adapted from the Raymond Briggs children's book. Drawn in demure pastels and shot in a soft-focus effect, The Snowman tells the story of a young boy's snowman who springs to life one night and spirits the lad away from his mundane existence into the land of snowmen, up north, where gaiety reigns. They dance, they sing, they make merry with Kris Kringle himself. To get there, the boy takes the snowman's hand and they fly--oh, how they fly, through the spectacular glittering multi-colored lights of the Aurora Borealis, across a snow-covered continent, floating, soaring, gliding with a ballet dancer's grace, all to the accompaniment of a beautiful song, "We're Walking In the Air," sung with ethereal plaintiveness by boy soprano Peter Autry, before alighting at the North Pole. When the festivities end, snowman and child return home; the boy awakens the next morning, anxious with delight to engage his frozen friend anew, only to find the sun has reduced him to a scarf, a hat, and a carrot that had served as his nose. As the camera pulls back, the boy, solemn, saddened, stands alone in a sea of white, mute and staring at the lone remnants of the previous night's revelry, sustained only by his memory. Despite the bittersweet ending, The Snowman is a tale told beautifully, made doubly evocative by the striking images, the soothing colors and the warmth emanating from the characters as they bond in friendship. Among holiday fare, The Snowman is the most subtle and most haunting tale. In leaving the ending open to interpretation Briggs and the filmmakers suggest imagination as a transportive, transcendent gift, which, when exercised, creates vibrant new worlds. If you dare visit them, you may never see the old world the same way again. The Snowman has never caught on in the U.S. as it has in England, where it’s a veritable cottage industry. Every holiday season The Snowman emerges as a theatrical production, complete with a road show, and an annual "Snowman Spectacular Fundraising Ball" to raise funds for the Chestnut Tree Children's Hospice in Sussex, which cares for children and young people with life-limiting and life-threatening illnesses. For the amazing world of Snowman-related activities, visit www.thesnowman.co.uk/home.htm.